Special EventsRing in the New Year at Champs! I think it’s safe to say 2017 was pretty crazy, and what better way to remember all of the good things that happened (and forget about all of the bad ones) then hanging out with all of us at Champs! We’ll be open all night long partying with DJ Mobile Madness! 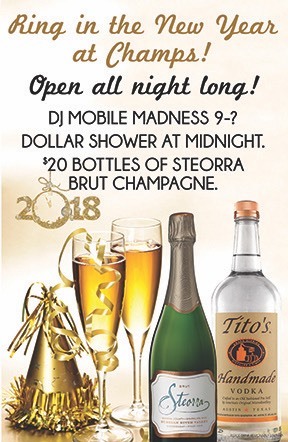 There will be $20 bottles of Steorra Brut Champagne and a dollar shower at midnight!